Content marketing strategy is a growing interest for B2B business development teams. This article explores some content types and explains when to use them. Generating leads is usually an important part of the content marketing strategy. Content that can be used to generate new leads includes website landing pages, articles, blog posts and press releases. Maybe your firm has expertise in traditional accounting areas such as financial accounting, corporate finance, mergers and acquisitions or tax? Perhaps you have developed expertise in new areas such as data analytics, digital insight, cyber security and forensic accounting? Whatever your specialism, when it comes to generating leads, you’ll want to connect your firm’s expertise to the topics that are of most interest to your potential clients. The idea is to produce content that resonates with your target audience by showing that you understand their problems and can offer effective solutions. Google provides some useful tools that help you understand your market since searching for information online is usually the first step in a potential client’s journey. If you are not already using them, check out Google Analytics and Google Search Console, both of which provide useful insights into your website’s traffic. Let’s now look at an example: The owner-manager of a small business currently looks after his own accounts. The work is time consuming and he suspects it is not a productive use of his time. He is vaguely interested in outsourcing this work but he’s never taken the time to focus on what that would involve. From time to time, he Googles ‘accounting services’ to see which accounting firms provide services for businesses in his sector and locality but because he has never found a firm that ticked his interest boxes, he’s never pursued the search. From an accounting firm’s point of view, content that might catch this potential client’s attention includes articles or blog posts bylined by a local accounting firm or a firm that specialises in the owner-manager’s sector, that explain how outsourcing accounting can save his business time and money. The right content — whether that is a website landing page, article or blog post — may help move this potential client further along in his journey towards purchasing accounting services. If the content on your website is effective, it will persuade this potential client to put your firm at the top of his list of potential service providers. Remember to make it easy for potential clients to contact you by including easy-to-access contact information. It is also a good idea to include social sharing buttons as they can help generate further leads when your website visitors share your content. The objective of lead generation is to help potential clients recognise a problem and to show how your firm solves that problem. Once the potential client is aware that he has a problem, he is more likely to move to the next stage which is when he begins to research potential service providers. In addition to the content types already mentioned, case studies and testimonials are often persuasive when potential clients are at the research stage. If you don’t already use these content types, they may be worth including in your content marketing strategy. Let’s return to our example. The owner manager recognises that he needs help with accounting and is now researching potential service providers. He is interested in firms whose clients include businesses similar to his own. He thinks that these firms will understand his business and he won’t have to spend time explaining the obvious. 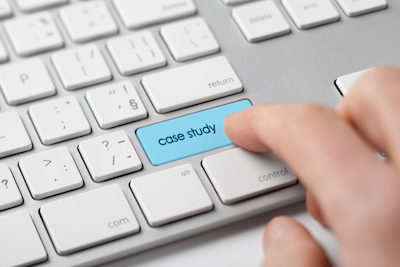 Case studies and testimonials are content types that are useful at this stage. Testimonials from satisfied owner-managers who describe how your firm’s services saved them time and money will help to move this client closer to doing business with your firm. In business, trust helps to build relationships. Content types that help your firm’s credibility and establish trust include articles that you contribute to news and industry publications, presentations delivered at industry events, slideshares, content and links that you share on social media and so on. These content types also build brand awareness which in turn supports further lead generation. There are three stages on your potential client’s journey— awareness, research and conversion. In our example, the owner-manager has passed through the first two stages: he is now aware that he has a problem and he has researched potential solution providers. He now has a shortlist of three or firms that he plans to speak to. Content that will interest him at this point on his journey includes the website profiles of relevant people in your firm and links to their LinkedIn profiles. This information will help with trust and reassure him that he is making a good choice. Obviously, it’s also important that you have easy-to-access contact information on your website, blog, newsletter, social media profiles to make it easy for the owner-manager when he’s ready to make that call! Content doesn’t end when you’ve captured new business. Good content is also a useful tool for building customer loyalty. Many businesses proactively monitor customers’ frequently asked questions and create content to answer those needs. Other content types used in customer service include email and newsletters, client briefings and events. Personalisation tools can be used with many different content types and platforms to improve customer service in real time. In the professional services sector, thought leadership content can help you win new business. When your firm is recognised for its expertise in a particular area, you are likely to win referral business from your peers. Activities that can help you become recognised as a thought leadership activities include providing expert commentary for the media in your area of expertise. Content types associated with thought leadership include research and surveys, reports, white papers, published articles and studies. Leadership implies influence and influence requires a broad audience so your firm’s distribution of its thought leadership outputs is an important aspect of this activity. For more insight into thought leadership, see What exactly is thought leadership and how do you become a thought leader? In this article, I have touched on a variety of content types — web landing pages, articles, blog posts, case studies, testimonials, keynotes, reports, white papers, email, newsletters and social media. It is likely that your firm already produces some of the content types outlined in this article. Thinking about that content from the perspective of your potential client can improve the return on your investment. If you need help in creating, updating or making your content work harder for you, please contact me to discuss your specific requirements.